This is the second time I’ve stumbled across a delicious perfume in, of all places, TK Maxx. I know I should be saving up and buying beautifully wrapped bottles from expensive boutiques, but for a start I don’t earn much and, second, I rather like the occasional gamble on a discounted scent that might just turn out to be fab. That’s certainly the case with Ninfeo Mio, a small bottle of which I picked up for a song a little while ago. I’m a bit of an Annick Goutal fan, mainly for the powerful, love-it-or-hate-it Sables, but also for the better-known Eau d’Hadrien, so Ninfeo Mio seemed worth a bet – and I’m glad I took a punt. This unisex perfume was launched in 2009 and created by Isabelle Doyen, who was Annick Goutal’s assistant, and took over the development of new perfumes after Goutal’s death in 1999. The first thing you smell is fig, and actually that’s pretty much the last thing you smell too, and that would be just fine and dandy with me, since fig is a scent I love – both the natural thing and figtastic perfumes like Premier Figuier from L’Artisan Parfumeur and Philosykos from Diptyque. But the fig in Ninfeo Mio is mixed with lemon and lavender, musk and hedione, the chemical that gives Eau Sauvage much of its particular magic. These add to the character of the scent, but I think they also accentuate the figginess of the fig, which is fresh and green and slightly sweet but also a little bit dirty, with something of the sexiness of fresh sweat. It’s not, perhaps, as refined a perfume as Premier Figuier, but I love its in-your-face earthiness. As is so often the case, the name and the marketing ‘story’ came after the scent, or at least after it was begun. It refers to the much mooned-over gardens of Ninfa in the once-malarial marshlands south-east of Rome, which (luckily for Isbelle Doyen) turned out to be full of lemon-trees, lavender and figs. 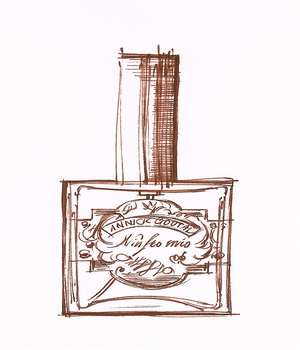 The perfume would probably have been called Ninfa Mia except that the name ‘Ninfa’ had already been copyrighted, so the more masculine Ninfeo Mio it is.